As I get ready to celebrate the holidays with my family this year, I’m preparing to pay special attention to my father and grandmother. Both have had a stroke in the past. And while both are doing well, I learned earlier this year while working on a project that the biggest risk for a stroke is to have had one already. I also found that the incidence of stroke – and heart attacks – increases at the holiday season. I’m hopeful that I won’t be calling 911 but I’m much more aware of the signs and symptoms of stroke, particularly after participating this past August in a nationally syndicated public service announcement (PSA) supporting the American Stroke Association. As an intern with the Public Affairs department, I was fortunate enough to participate in the video shoot that sought to educate and advocate for stroke awareness. Shot by Jacksonville photographer Paul Figura (who also handled the “My Answer” advertising campaign for Mayo Clinic) and produced by the Dalton Agency, the PSA was a unique experience. Certainly, filming isn’t all the glitz and glamour one might think. It’s more like running around, sweating, stressing, and then doing something and repeating it, again and again, all while trying to overcome Florida’s rain and humidity. It was not difficult to see that video production is definitely no walk in the park, but the end result was well worth it. Following along with the crew behind the shoot was both educational and lots of fun. Everyone involved took their work seriously while managing to stay down to earth at the same time. And it provided me an opportunity to learn first-hand about stroke, its impact on families and the magnificent work done by Mayo Clinic physicians and stroke team members, who, with many of our patients, became the stars of this national campaign. Getting to know the patients and staff, and hearing their personal stories of triumph over an often debilitating disease, was amazing. From Sean Bretz, a 23-year-old U.S. Coast Guard technician who couldn’t move more than his left thumb but now is pursuing a degree to become a physical rehabilitation specialist, to Jackie Golden, 61, a former long-distance cyclist, and Jessica Cook, a young mother of three who had her stroke on the soccer field, I learned that stroke could affect anyone, no matter their age, gender or workout schedule. While I’m thankful to have participated in this experience – it was a great opportunity for me to be a part of – I can only hope that I never have to use the knowledge I gained. As I prepare to celebrate Christmas and a new year, I also hope others will take a moment to be cognizant of the signs of stroke and seek appropriate care if needed. Just because you’re on vacation doesn’t mean it can’t happen to you or a loved one. Best wishes for a safe and healthy New Year! Working as an intern in the Public Affairs department at Mayo Clinic in Jacksonville, Fla., I expected to learn about health care. Little did I realize I’d be learning so much about my own health and how to improve it. In the past two weeks, I not only passed out flyers, worked events and assisted the staff – all things I expected – but I also helped with press releases and media advisories on topics ranging from hurricane preparedness to cancer and heart health. For me, heart health really hits home since my maternal grandfather suffered from heart disease and passed away from a heart attack before I was born. He was a journalist so I believe his love for writing was definitely passed on to me, but I also began to wonder if I had the propensity for heart disease, too. As part of my internship assignments, I have been helping to promote the American Heart Association’s local Heart Walk, of which Mayo Clinic is a sponsor. 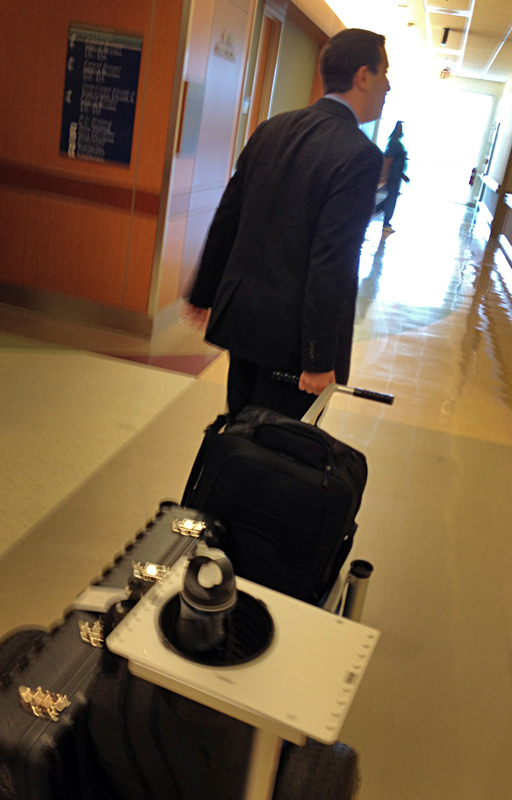 Pulling our public affairs video equipment through the hospital after a shoot…and helping my heart of course. 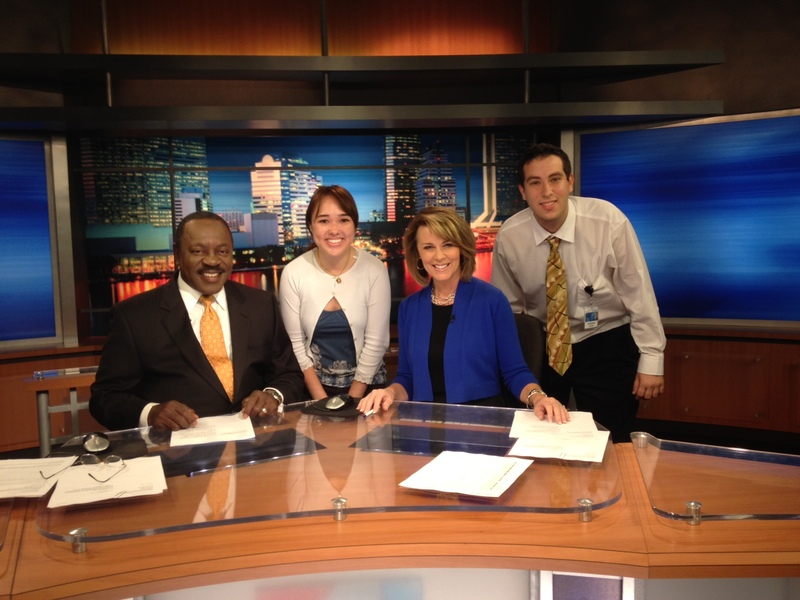 One of my assignments was to prepare materials for an interactive media event with WJXT Channel 4 and two Mayo cardiologists. I researched heart health info and found some great resources on Mayo’s web site, including a series of YouTube videos on signs and symptoms of a heart attack, reducing your risk for stroke, heart healthy recipes and more. 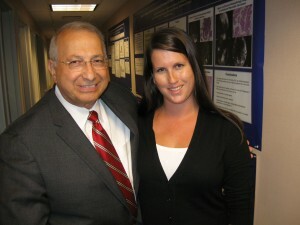 I also got to sit in for an interview with Dr. Issam Moussa, chair of the division of cardiovascular services in Florida, where I learned just how big of a role family history plays in one’s heart health. Certainly, some of my grandfather’s genes were likely passed down to me, but with awareness and prevention, I can reduce my risk of devastating heart issues. I also learned that staying active is important in reducing one’s risk for heart disease. To that end, I’ve signed up to participate in the First Coast Heart Walk on Saturday, Sept. 22. My hope is that with each step I take, I am helping build awareness for heart disease and celebrating those who have made significant strides against the number one killer in the United States. Of course, as I step out with my fellow colleagues and members of the community, I’ll surely be thinking of my grandpa every step of the way. We shared this story to our facebook and twitter accounts. Feel free to like, share & retweet! When the Mayo Pharmacy opened on the Florida campus in November 1986, its lone pharmacist, Nan Sawyer, filled just 11 prescriptions that day. Little did she know, 25 years later, the pharmacy would fill its one-millionth prescription. “Reaching that number is a remarkable milestone,” says Sawyer, “But what really matters is what got us there – focusing on each patient’s needs.” Individual patient attention has been the pharmacy’s goal from the start. “When we first opened, we were all consumed with delivering high value health care to each and every patient, as we knew Mayo Clinic had to establish itself in the south as the premier health care facility,” says Sawyer. The pharmacy has come a long way since it began in October 1986. There are now four pharmacists, six technicians and a cashier who fill about 1,500 prescriptions a week. Today’s director of Pharmacy, Deborah Crumb, says that individual attention to each patient is still what sets Mayo Pharmacy apart from others. 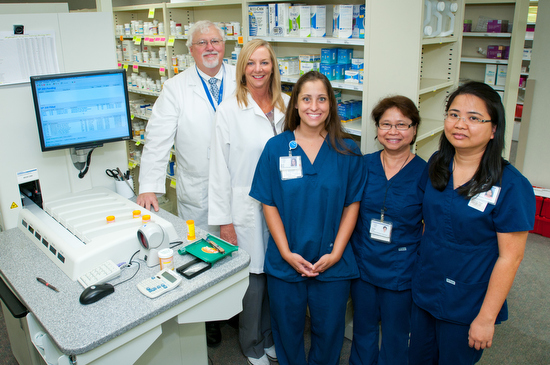 Mayo Pharmacy takes patient care and attention a step further with its medication therapy management program, a one-on-one conference with a Mayo pharmacist to go over all of their medications, possible contraindications, and how best to take their different medications. Transplant patients, who take multiple medications to prevent rejection, are among those who take advantage of the program. “This goes further than a patient consult,” says Crumb. “Some of our patients take up to 30 different prescriptions; it’s very important they understand how best to take their medications so there are no adverse affects. Sometimes, we are able to eliminate a drug or find a less expensive alternative.” Patients who use an inhaler or a blood glucose monitor often seek a medication therapy management appointment so they are able to use their device on their own. “In my younger years, I never gave much thought to what life could hold after 60 or even 70. I didn’t think I would get there,” he says. But he did. And while he discovered unexpected new and exciting life opportunities, experiences & pleasures, life caught up with him. 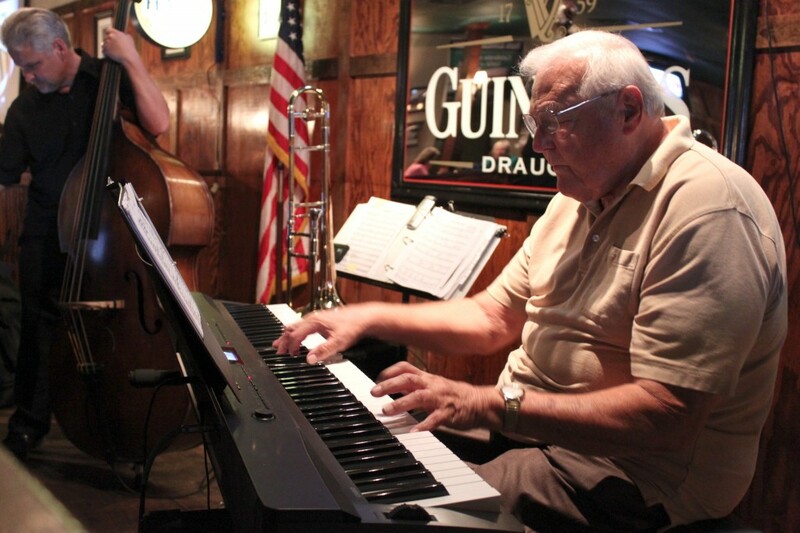 So touched by the story – and to help spur awareness and fundraising for Team Mayo Clinic and the AHA – Thomas will play a special heart walk benefit concert at Culhane’s on Wed., Sept. 21 from 5 to 7 p.m.
During the past few weeks, my Mayo Clinic experience has come full circle. As a Public Affairs intern, I am able to now use my passion for Mayo Clinic from a new perspective. 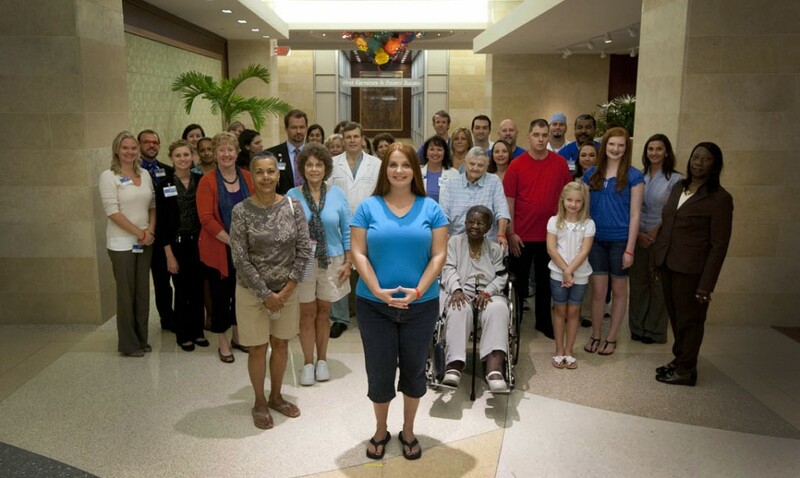 My journey at Mayo Clinic began in May 2010. In February 2010, I was diagnosed with a rare inflammatory disease known as eosinophilic esophagitis. The chronic illness, commonly found in children, is allergic in nature. The presence of the allergen results in a high concentration of eosinophils in the esophagus. Most often the allergen causing the illness is food related, however, new research shows environmental allergens are also a contributor. The main symptoms of eosinophilic esophagitis include chronic inflammation of the esophagus, pain and difficulty swallowing. I had experienced symptoms my entire life but spent years misdiagnosed. In February 2010, I connected with a doctor who examined my past biopsies and identified the cells needed for diagnosis. Due to the rarity of the illness, I was referred to Dr. Sami Achem, a gastroenterologist at Mayo Clinic. Dr. Achem’s research interests include gastroesophageal reflux, non-cardiac chest pain and eosinophilic esophagitis. My appointment with Dr. Achem was in May 2010, and I was extremely impressed with the time he spent speaking with me and his expertise on the illness. 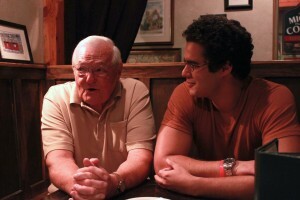 From my first meeting with Dr. Achem, I will say, my life changed dramatically. I spent several days at Mayo Clinic undergoing extensive testing to better understand my illness and the underlying cause. I was so pleased with the treatment by staff members, nurses and doctors. I was treated as a person, a guest on the campus, rather than a sick patient. The staff orchestrated a detailed itinerary allowing me to feel comfortable going to different departments throughout the campus for testing. Following testing, an ongoing treatment plan was prescribed including drug intervention and diet modification. Since my first week at Mayo Clinic, I have stayed in close contact with Dr. Achem. We have had several consultations in the past year to discuss treatment modifications, new research and long term expectations for the disease. He is easily accessible and shows great concern for his patients. I owe the significant improvement in my health to him as well as to the other doctors, nurses and staff members at Mayo Clinic. My positive patient experience at Mayo Clinic sparked a passion for this organization and the health industry. I pursued an internship opportunity in the Public Affairs department for several reasons, primarily to be a part of the organization that has given me so much. Mayo Clinic had already been a source of invaluable consultations for my long-time autoimmune Sjogren’s Syndrome and for genetic counseling to ascertain potential genetic predisposition for the autoimmune conditions, cardiomyopathy and cancer that populated my family tree. But late in 2008, skilled staff at Mayo Clinic in Rochester, Minn., greatly increased the odds that I’d be alive to write this blog entry at the beginning of 2011. I’ll be forever grateful to the surgical, oncology, gynecology, digestive health and complementary/integrative medicine staff that have provided medical treatments and ongoing consultations for my metastatic appendiceal adenocarcinoma. Light vaginal bleeding in the setting of a prior total abdominal hysterectomy began late in September 2008 while I was at the University of California in San Francisco participating in an international genetic study of Sjogen’s Syndrome. A biopsy at Luther Midelfort – Mayo Health System in my hometown of Eau Claire, Wisc., in late October revealed adenocarcinoma consistent with a colorectal primary. While my diagnostic colonoscopy revealed no signs of colon cancer, the staging CT scans revealed an appendiceal mass and a vaginal cuff mass. Surgical consultations were set to begin November 18 at Mayo. Pulsating lower right quadrant pain landed me in Luther Midelfort’s Emergency Room on the afternoon of November 5th. The Emergency Room doctor treated my pain, and once my condition was stabilized, sent me off to Mayo Clinic in the middle of the night with plans to see Dr. Donald Jenkins, a critical care surgeon stationed at St. Marys Hospital, to serve as the lead for my medical team. My post-surgical consults a few weeks later included Dr. Jenkins, medical oncologist Dr. Axel Grothey and internal medicine physician Dr. Amit Sood, with Mayo’s Complementary and Integrative Medicine program that I’d read about months ago in a Mayo Clinic newsletter. 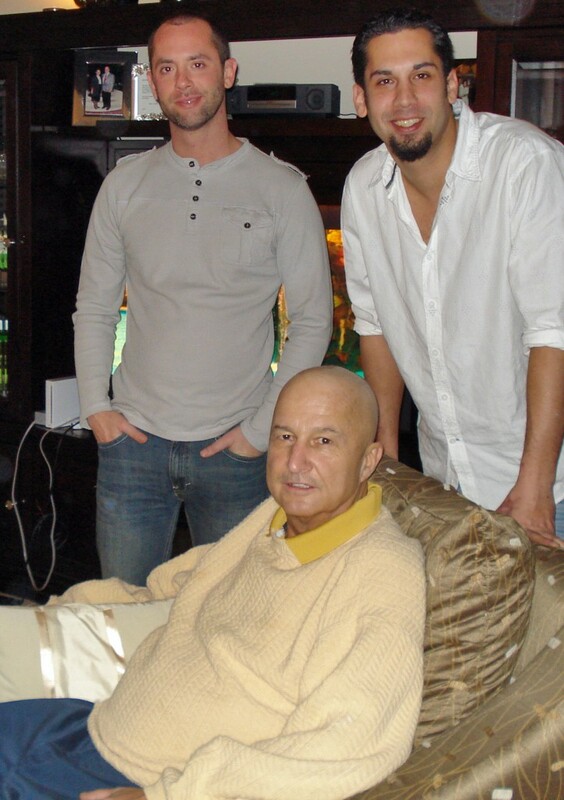 Dr. Grothey has consulted closely with my Midelfort Clinic oncologist Dr. Sandeep Basu to guide my chemotherapy regime. 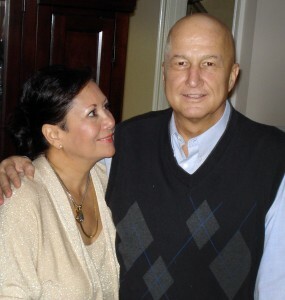 Twelve rounds were provided at Luther Midelfort’s Cancer Center from late December 2008 to mid-June 2009, with quarterly CT scans, blood work and Dr. Grothey consults at Mayo. I have found the office visits I’ve continued with Dr. Sood particularly valuable, in addition to his paced breathing DVD (also available as an IPhone app) and his Log On book detailing his many recommendations for mind-body healing. Unfortunately vaginal bleeding in mid-February 2010 followed by a biopsy confirming vaginal wall invasive grade 3 adenocarcinoma of the appendix had metastasized. PET/CT scans also identified multiple peritoneal nodular regions suspicious for tumor recurrence. I started back on chemotherapy the end of March 2010, this time of a palliative nature. Surgery was deemed not an option. The cancer is now considered advanced, incurable and eventually terminal. I just completed chemotherapy treatment 27 at Luther Midelfort. experiences and feelings and to gather up love and support from all over the country. Good friends here in Eau Claire helped me organize a “Share the Care” Morning Glories Circle of Care network to lend practical assistance and encouragement. My many years as a social worker with older adults and disabled persons continues to be an asset for me at this juncture, particularly my years with Hospice. I’ve arranged for my body to be donated to Mayo Clinic for medical research, continuing the family traditions of my father Jim who died of cardiomyopathy and my sister Mary who died of ovarian cancer. I continue to value my quarterly visits to Mayo, where I always stop by for a few quiet moments in the life-affirming meditation chapel. Staff at the Stephen and Barbara Slaggie Family Education Center has kept me apprised of any up-to-date research articles on appendix cancer. I was thankfully able to participate in a brown-bag session on Intensions for Healing which connected me with other cancer patients intent on living a full life. I look forward to receiving chemotherapy in the new cancer center at Luther Midelfort. I remain thankful that the close collaborations between my Mayo Clinic and Luther Midelfort medical teams have given me many days of living, with a hope of many more. And we are all rooting that I shall be in the audience at the University of Chicago in June 2012 to see my youngest daughter graduate. My “Dianne’s Future Amazing Life Adventures List,” that I started while awaiting surgery at Mayo Clinic, has served me well since my cancer diagnosis. I’m hard at work adding new dreams for 2011. My most important life goal right now is to create fun, lasting memories with my two delightful young adult daughters Emma and Sally O’Brien. 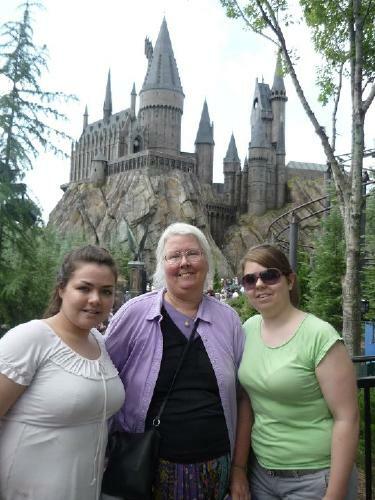 Together, we crossed out one of my “Amazing Life Adventures” list dreams by enjoying the Wizarding World of Harry Potter in Orlando, Fla., this past September. To keep me hopeful that my continuing chemotherapy treatments will garner me many more months of quality living, we are scheming to tour southern England in late August on the trail of writer Agatha Christie, whom we all relish. Hope is a very powerful thing. It could happen! In the video below, Dianne shares some of her story. Student Lauren Taylor (right) and Wendy Rogers. I was excited to begin my internship with the Public Affairs Department at Mayo Clinic’s campus in Jacksonville, Fla. As I drove to the clinic my first day, I thought about what I might do. I expected to spend time working in the hospital and to see patients, doctors and nurses around. 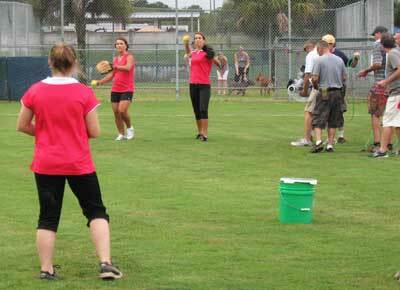 But attending a rainy softball practice with a dozen 14-year-old girls, a production crew and a breast cancer survivor? Definitely not on my list of expectations! Little did I know, the week I chose to start happened to be the same week that production began on Mayo Clinic’s new television commercial. In other words, it wasn’t just the normal whirlwind of activity – with staff juggling multiple meetings, answering pages from doctors and coordinating interviews for news media – but an extra spin that included cameras and a production crew of more than 30. On location for a video shoot. Chaos aside, watching the making of Mayo Clinic’s commercial, which featured breast cancer patient Wendy R., was an amazing way to start my internship. One of the most interesting parts of the production was the truthfulness and accuracy of the commercial. I always assumed that health care commercials seen on television were scripted stories most likely portrayed by actors. And while some might be, Mayo’s production was definitely not. Every last detail was depicted honestly, a quality I found quite refreshing. Wendy’s remarkable story was told by her, her real family, and real Mayo doctors and staff members. In fact, the casting was so meticulous that there were representatives from each and every specialty area that works with breast cancer patients involved in the shoot. Although I just began my internship with Mayo Clinic, I already feel like I’ve learned so much. Mayo Clinic’s Model of Care is obvious, as is their commitment to honesty and transparency, which I never expected to find “in the real world.” I’m thankful for the opportunity to be a part of this world-class organization.